"Good handwriting is a necessary part of education," says Mahatma Gandhi in his autobiography titled 'My Experiments with Truth'. Fourteen-year-old Basavalinga swears by this advice from the Mahatma. A student of Government High School Hesarghatta, Basava's deep passion for the Engligh language has resulted in his style of script since his handwriting is just like Calligraphy. Basava was just 11-years-old when he had to join a boarding school near Raichur. Since then he has developed a sense of independence. 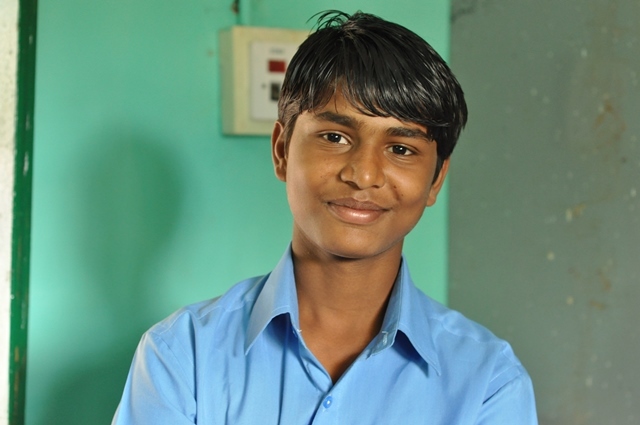 This 14-year-old boy is the only child to his parents and hence his only goal is to study well and support them. "My parents have studied just till standard X. They have been working as labourers all their life. They encourage me to study well just so I don't suffer the hardships that they went through," says a determined Basavalinga. His favourite subjects being Social Sciences and Mathematics, he aims to understand governance and get into the Civil Services. Basava is much disciplined, be it his attire, eating habits or school work. Explaining about the free facilities provided at government schools, Basava says, "My school teachers have disciplined us with great values and hygiene. I trust the food that is provided to us in school as it supports our education. It is safe, nutritious and fresh. I stay in a nearby hostel since my parents live in my native town. They give us food there too, but it is quite monotonous. I like the Akshaya Patra mid-day meals better!"